Researchers at the University of Maryland (UMD) are revolutionizing energy storage with a new class of aqueous electrolytes that makes batteries and other electrochemical devices safer, cheaper, and greener. The safety hazards of today’s lithium-ion batteries are well known – toxicity, instability, and flammability – notably grounding the Boeing 787 Dreamliner after a series of fires. These shortcomings have inspired a team of UMD researchers, with collaborators from the U.S. Army Research Laboratory, to find a solution: a Water-in-Salt electrolyte that offers safety without sacrificing energy density or power density. The Water-in-Salt electrolytes were created through the joint efforts of Dr. Wang and fellow UMD Chemical and Biomolecular Engineering researcher Dr. Liumin Suo, and the U.S. Army Research Laboratory, led by Dr. Kang Xu (ARL Fellow). Participating ARL researchers include Dr. Oleg Borodin, Dr. Arthur Cresce, Dr. Selena Russell, and Dr. Marshall Schroeder. Funding for the project is being provided by the Department of Energy’s (DOE) Advanced Research Projects Agency-Energy (ARPA-E). Dr. Wang and his fellow researchers are eager to take these electrolytes to the next step and create a battery that will demonstrate the power and promise of this new technology. 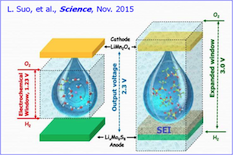 Looking toward the future, this invention will be a critical step in fulfilling the long-awaited hopes of replacing the current electrolyte solvents found in lithium-ion batteries. To learn more about the University of Maryland’s “30 Days of EnTERPreneurship,” visit: http://www.umd.edu/30Days/.